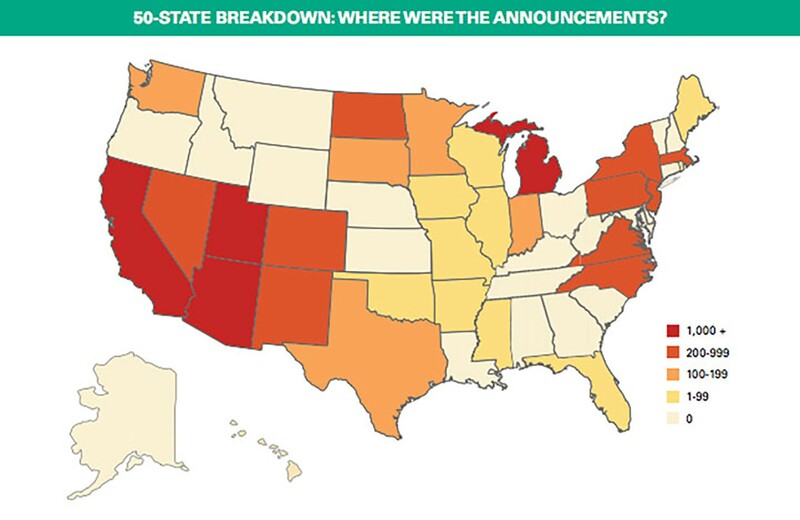 The states with the highest planned increase in renewable-energy jobs from the second quarter of 2014, according to an Environmental Entrepreneurs report. WASHINGTON – Arizona businesses announced plans earlier this year to hire more than 3,000 workers in clean-energy industries, letting the state claim the biggest growth in renewable-energy jobs in the nation for the second quarter of 2014. A report released Thursday by Environmental Entrepreneurs said the bulk of the new Arizona jobs – and a large share of the total planned for the nation – could be attributed to the proposed Solar Wind Energy Tower project in San Luis. Developers of that project said they plan to add 2,350 workers, with most of those being construction jobs at the $1.5 billion plant. 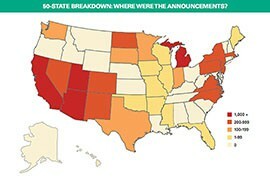 That announcement allowed Arizona to knock California out of first place for the quarter. The report does not measure actual hiring but only a company’s announced plans to hire workers across the range of clean-energy industries, from solar- and wind-power generation to electric vehicles and insulation. Between April and June, those businesses said they planned to add 12,582 such jobs nationally. Solar-power firms announced the highest number of hires for the fifth consecutive quarter, with 5,895 jobs, while wind-power businesses were second with a planned 2,750 hires, according to the report. The biggest numbers by far came from the San Luis project. Even though most of the jobs announced this spring will be temporary, backers said they will still provide years of employment in the area. “The project is set to be finished in 2018,” said Stephen Sadle, chief operating officer of Solar Wind Energy Tower Inc. And once finished, it is expected to provide up to 500 permanent jobs, he said. The project calls for the construction of a huge tower with turbines at the bottom. 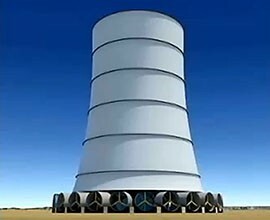 Hot desert air would be cooled at the top of the tower, causing it to drop and flow out through the turbines, turning them to generate electricity. Officials say the San Luis project is just one example in a state that is well positioned for “great growth” in renewable energy in coming years. “I would expect the (clean-energy) job outlook to continue to be very positive,” Bitter Smith said. In a teleconference to release the report Thursday, California-based clean-energy officials cited Arizona’s business-friendly outlook and natural resources for its success attracting renewable-energy businesses. “A lot of Arizona’s newly announced jobs came from projects dealing with solar energy,” said Bob Keefe, executive director at Environmental Entrepreneurs. Jonathan Foster, chief financial officer of Nexant, said on the call that Arizona’s solar resources are second to none. The San Luis project was one of five in Arizona that announced hiring plans in the second quarter, according to the report. It said Jinko Solar plans to add 300 jobs in Pima County by the end the year, while Vivant Solar, Luke Air Force Base and OneRoof Energy plan to add a total of 410 solar jobs in the Phoenix metro area. A rendering of the proposed Solar Wind Energy Tower in San Luis, which designers say would generate power by forcing cooled air through turbines at the tower's base. Arizona had the fastest growth in planned renewable-energy jobs in the nation in the second quarter of 2014, according to a report by Environmental Entrepreneurs.